The Federal Reserve will almost certainly raise its benchmark rate in under two weeks — for the eighth occasion since December 2015. For a market dizzied by the helium of low interest rates, rising rates are a sobering dose. The stock market has withstood the business to date. But how many additional rate hikes can it endure before collapsing under the strain? Two… three… four… maybe more? Today we reveal the precise rate hike that will trigger the next bear market — and when you can expect it. But first, what was Monsieur Market up to? The Dow Jones was up 147 happy points today. The S&P closed the day 15 points higher, the Nasdaq a jaunty 59. Relaxed trade war jitters was the explanation on offer in the financial press. How many rate hikes can the stock market endure? That is… which rate hike will prove the straw that fractures the camel’s spine? Mr. Barry Bannister directs investment firm Stifel’s institutional equity strategy division. He was one of few who accurately foretold February’s correction — while the stock market was slipping the bonds of gravity — and reality was slipping its leash. It concerns what the economics profession calls the “neutral rate” of interest. The neutral rate is the interest rate that neither stimulates the economy… nor restrains the economy. Anything below the neutral rate pushes. Anything above it pulls. 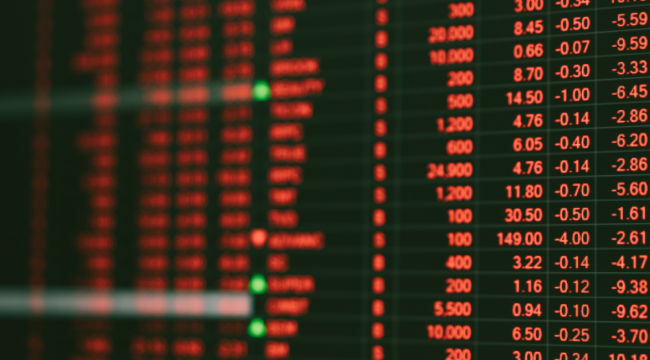 Many consider the neutral rate impenetrable, unknowable… “as elusive as sheet lightning playing among June clouds,” in the words of writer James Huneker. A “maximum tolerable peak” for the fed funds above the neutral rate has been associated with bear markets since the late ’90s global-debt boom. 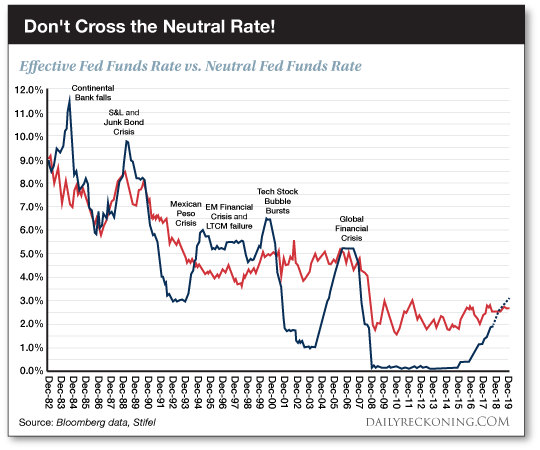 The fed funds rate has been below the neutral rate for a decade running. But the Federal Reserve has been hard at hiking rates since December 2015. And the fed funds rate now eyes the neutral rate, as the chart reveals. Meantime, official statistics suggest the labor market is drum-tight. And inflationary rumblings, long dormant, have been heard and felt. August’s consumer price index increased 2.7% over last year, for example. Hourly earnings also increased 2.9% year over year. The official unemployment and inflation data — accurate or not — compel him to continue hiking rates. But additional rate hikes will lift the fed funds rate above the neutral rate… and invite a bear market in stocks. Weighing stability versus mandate, we believe the Fed has no realistic option other than [raising rates], eventually revealing the speculative excesses created in the past decade. Fine and well, you say — but enough is enough. Just tell me how many more rate hikes will trigger the bear market. The definitive answer, says Bannister… is two. Two additional rate hikes take the fed funds rate above the neutral rate. The first of these will almost certainly arrive in 13 days, at the conclusion of the Fed’s “Open Market” Committee meeting. The market currently places the odds at 97.4%. We will likely be treated to the second rate hike in December — 80.1% are the odds given today. Thus the Fed will likely cross the neutral rate by year’s end. The bear market follows if the foregoing holds. “But ‘within six–12 months’ seems assured,” he concludes. The arithmetic therefore puts June 2019 on watch. The window remains open through next December. But perhaps the Fed will be on alert, you say, and spring to action when circumstances demand. History indicates that the next bear market may be quite rapid, probably exceeding the reaction time of the Fed. A dozing tree sloth on a full belly exceeds the reaction time of the Fed, we might add… but will not. Regardless, you are free to salt the preceding to your own individual taste. How many false alarms have gone out over the years? A tricky catch, it is, to time any market event. We have suggested previously that the bull market could parade on another year or two. Bannister’s schedule fits neatly inside our own.